The Gunung Sahendaruman Protection Forest encloses an area of 3,500 hectares, but forest of good condition is only found within an area of 1,300 hectares (Martin 2018). Within this, only a proportion is suitable for the species (Martin 2018). The Protection Forest is largely mixed agriculture and spice tree plantations, which does not satisfy the designated role of the area to maintain environmental services (water, land stability). Some forest is additionally protected as watershed for a hydroelectric scheme in the Kentuhang valley, though this is within the Protection Forest boundary. Since 2014, the day-to-day management of the Protection Forest is under the jurisdiction of the provincial government, and a Forest Management Unit was established in 2017 to undertake this duty. Burung Indonesia have been conducting periodic monitoring of the Critically Endangered species around the Sahendaruman crater with support from Vogelbescherming (Burung Indonesia 2009, Fauzan and Bashari 2016). An MPhil. project conducted fieldwork on Sangihe in 2015 investigated habitat associations of the critically endangered species to model the current extent of suitable habitat and evaluated the potential for habitat restoration in different locations on the island, but found very little potential for conservation away from the key location of Sahendaruman (Martin 2018). Burung Indonesia developed a series of community-based Village Resource Management Agreements (VRMAs) at key villages around the crater during the Global Environment Fund-supported conservation project between 2002 and 2006, which successfully slowed rates of forest clearance (BirdLife Indonesia 2007). 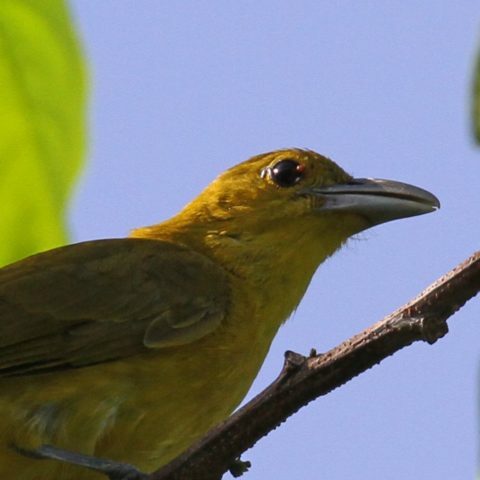 Sangihe is a priority site for the Critical Ecosystem Partnership Fund, and Burung Indonesia are the Regional Implementation Team for the Wallacea Hotspot. A project conducting a forest cover survey through ground-truthing remote sensed forest cover maps began in 2017, and an extension of the VRMA programme is planned. Between 1995 and 2005 the 'Action Sampiri'-project worked for biodiversity conservation in Sangihe and Talaud, conducting fieldwork, establishing conservation awareness programmes (including village and school meetings, distribution of leaflets etc.) and developing ideas for future land-use through agreements between interested parties (local people, local government, forestry officials and timber companies). This work included the rediscovery of Cerulean Paradise-flycatcher (Riley and Wardill 2001). There have been proposals to change the designation of the Protection Forest on Gunung Sahengbalira to the more strictly controlled wildlife reserve; however, this is considered to have the potential to greatly deteriorate community attitudes to the site, with potentially severely damaging results (Fauzen and Bashari 2016). The Wildlife Conservation Society has also worked on the island since 2007, trying to promote sympathetic land use and development by villages surrounding Gunung Sahengbalira (N. Brickle in litt. 2010). A local resident and former bird guide is monitoring the loss of native forest for plantations of exotic tree species and trying to raise awareness of the threat this poses to Cerulean Paradise-flycatcher (Sykes 2009, W. Pangimangan in litt. 2015). Ensure effective protection of habitat on Gunung Sahendaruman and work with local communities to restore recently degraded habitat within valleys otherwise suitable for the species. Support work to zone the remaining habitat within the Protection Forest boundary, and define a core forest area with collaboration with those that extract resources from the forest. Continue education programmes emphasising the value of forest cover to water retention and the benefits of sound farming practices on already cleared slopes. Lobby against government initiatives that encourage the clearance of native forest for plantations of exotic tree species. Conduct research into breeding success, population structure/genetics and rates of dispersal to inform the need for investigations into the feasibility of translocation/assisted recolonisation of additional valleys. 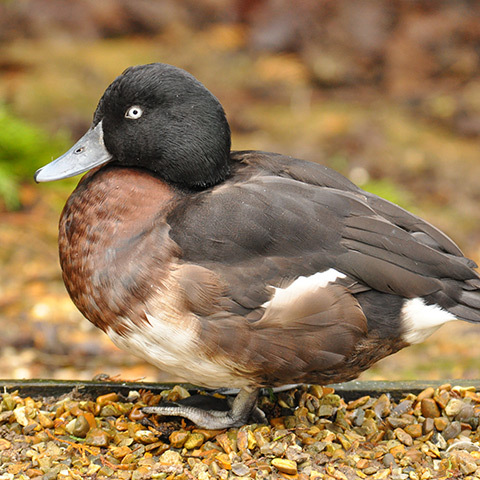 The species is endemic to the island of Sangihe, Indonesia (BirdLife International 2001). For over a century, it was known only from the type-specimen and was presumed extinct when searches in 1985 and 1986 failed to locate it (Whitten et al. 1987) (although an unsubstantiated report in 1978 later came to light [White and Bruce 1986]). The survival of the species was confirmed in October 1998, when the species was located in deep valleys in the Sahendaruman Crater in the south of Sangihe (Riley and Wardill 2001). 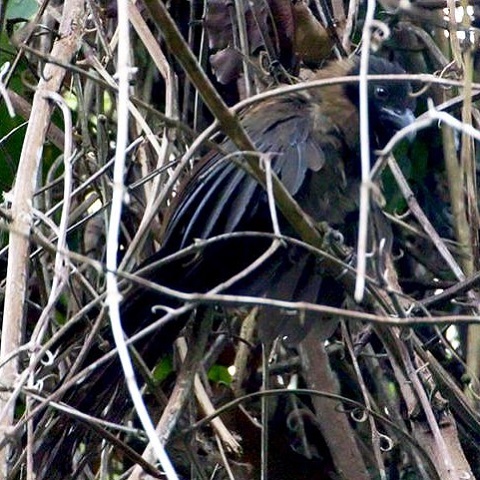 A series of surveys followed (Birdlife Indonesia 2007), which established that the species remained in at least 14 valleys, but the most recent information indicates that the species has been lost from at least two of these, following small-scale clearance and logging (Fauzan and Bashari 2016, Martin 2018). No birds were found in searches of the small areas of forest habitat that remain around Gunung Awu in the north of the island, and there is virtually no chance of any birds occurring away from Sahendaruman (Martin 2018). The total area considered currently suitable for the species (habitat with an equivalent or higher probability of species presence from habitat-association modelling) was less than 10 km2 (Martin 2018). The population is estimated to number 34-150 individuals (Fauzan and Bashari 2016), roughly equating to 21-100 mature individuals. This total is similar to those reported from 2001 (19 to 135 birds [Riley and Wardill 2001]); 2003, 2005 and 2006 (<215 birds [BirdLife Indonesia 2007); and 2009 (30-106 [Burung Indonesia 2009]). Each survey has visited a greater number of potential sites and added new locations, but has not managed to increase the total estimate. Virtually the entire island of Sangihe was deforested and converted to agriculture many decades ago, with a contemporary report from a visit in 1677 describing the hills 'even the biggest and highest, are planted with coconut trees' (Henley 2005). Very little habitat for the species remains on the island, particularly as it appears to prefer lower elevations. The total area of suitable habitat is estimated at less than 10 km2, but there are key features required within this area, which likely reduces this tiny area further. The primary threat to the species remains forest clearance by shifting cultivators, with its disappearance from two adjacent valleys between 2014 and 2015 coinciding with selective logging and small-scale clearance (Martin 2018). In 2009, it was reported that new government initiatives to plant alien tree species were resulting in the clearance of native forest (Sykes 2009). At first, planting was restricted to areas below 500 m; however, more recent reports indicate that planting is now taking place at higher elevations, in areas at 700-900 m (Sykes 2009). One valley in which three birds were observed in 2004 had been encroached by cultivation by 2009; alien trees being cultivated on Sangihe include nutmeg, coconut, teak and mahogany (W. Pangimangen in litt. 2012, 2013). Landslides represent a further potential threat to remaining habitat (W. Pangimangen in litt. 2012, 2013), with recent severe events exacerbated by land clearance (BirdLife Indonesia 2007). The species's highly restricted elevational distribution leaves it at severe threat from environmental changes. A particular concern is the observed fall in the average altitude at which water emerges, reported to have reduced the flowing length of the streams by up to a hundred metres within a decade (A. Daedali pers. comm.). All nests of the species that have been found were positioned directly above flowing water, suggesting that this is a key requirement that may be imposing a further constraint on the occurrence of the species. Climate change may be the ultimate cause, but even small scale habitat changes within the crater may impact the water retention rate. Harvesting of forest products may constitute a minor threat through disturbance (Riley and Wardill 2001).